Every year at the USK Symposium I get a chance to sketch with UK artist and illustrator Lynne Chapman. (That’s her on the far right in this lunch time doodle). So I know Lynne as an urban sketcher and as the author of Sketching People: An Urban Sketcher’s Manual to Drawing Figures and Faces . Imagine my surprise to find out that in addition to our shared hobby of urban sketching, Lynne is also an accomplished book illustrator with over 30 picture books to her credit. 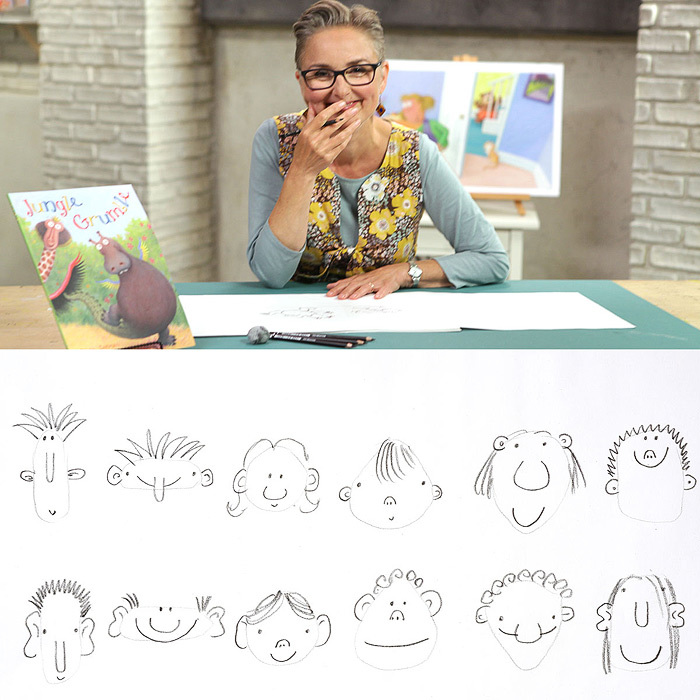 I am also pleased to see she’s recently become a fellow Craftsy.com instructor, releasing her first course Expressive Picture Book Characters. 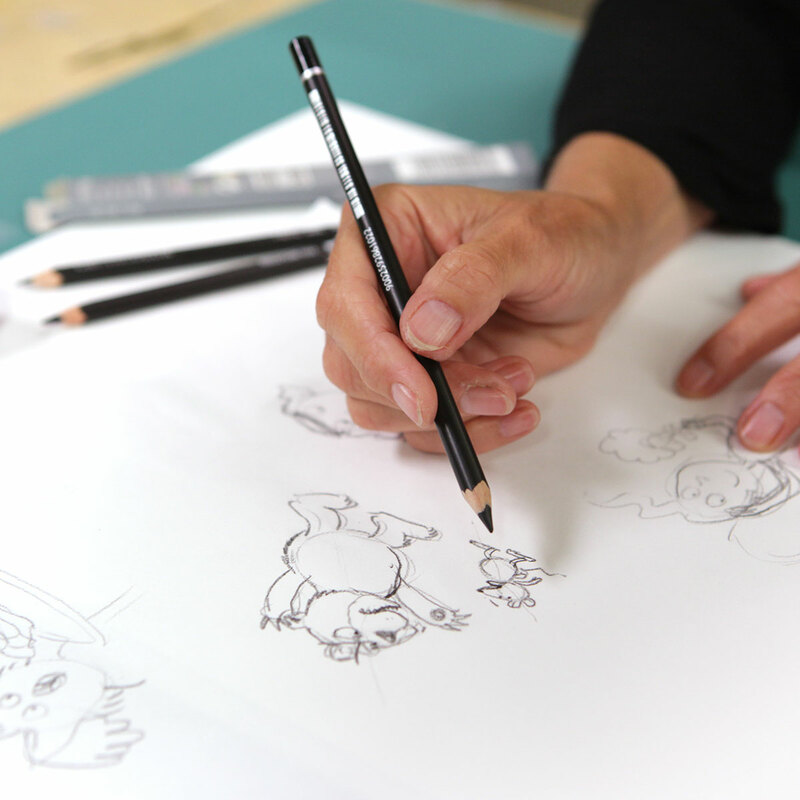 Lynne has produced an in-depth how-to on her subject: how to invent light-hearted stylized figures for children’s books – with an emphasis on capturing personality and conveying the emotion of the story. 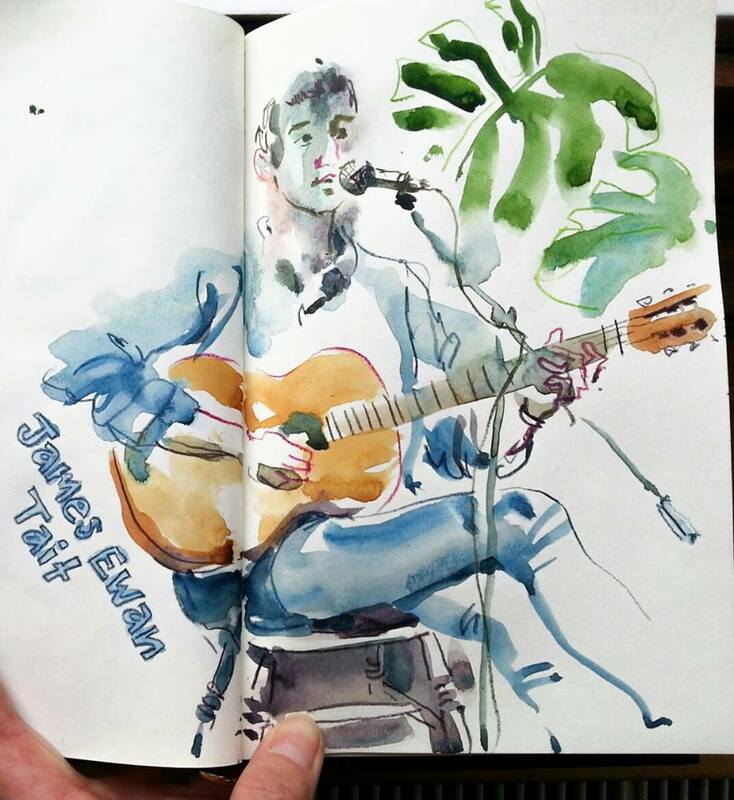 Here on Citizen Sketcher, I’m somewhat focused on the art of location sketching – but I’m also fascinated with the other kinds of artwork a sketch artist can get up to. To that end I’ve asked Lynne three short questions about the crossover between her professional illustration and her personal sketching practice. MTH: So Lynne – you’re a dedicated Urban Sketcher, organizing drawing events with USK Yorkshire among other interesting location sketching projects. Let’s talk about this split between sketching from the real world and your more imagination based work as an illustrator. What sort of skills or attitudes carry back and forth? Are there any ways one practice improves or influences the other? LC: Years and years of drawing from life have definitely made my life as an illustrator much easier. The link is not direct – I don’t take images from my sketchbooks and work them up into book illustrations – but the constant observation and interpretation I practice as an urban sketcher, means I can have a pretty good stab at drawing most things I need to, from my head. I usually need reference for the detail though: ask me how all the bits of a bike join together and I’ll have no idea, but I could still do a passable sketch of somebody riding one! MTH: Can you tell us a bit of what that it’s like when you’re doing a book project – maybe let’s talk about the ones you write and draw entirely yourself. How do you start making the ideas real – is it a slow burn or a creative sprint? About how long does it take from beginning to end? LC: It’s a far more drawn-out process than most people realize. When I get an idea for a story, I progress it by brainstorming-sketching on a big sheet of paper, creating possible narrative directions and quickly capturing funny pictures which pop into my head (this is where the drawing practice is so vital). I leave it and come back to it, several times over a period of anything from a couple of weeks to a few months (so I have fresh eyes), changing things, ironing out problems, adding more images and fine-tuning the dialogue. That’s just the beginning though. I next have to tweak the story line, to make it split into 14 double-page spreads (to fit the standard picture book format), then design all the spreads and draw it all out in pencil, ready to take to a publisher. That bit takes around a month. If I sell the idea, I will probably need to rework it yet again (which could be anything from minor tinkering to almost an entire rewrite. The end usually takes a lot of getting right). Eventually, I begin the pastel artwork, which generally takes me another couple of months. So, I am usually drawing a book for 3-4 months, but working on it, on and off, for more like 6. It takes another full year before it hits the shops. MTH: On a personal note – you’re currently doing a location drawing themed artist-in-residence program at Manchester University’s Morgan Center for Research into Everyday Lives (which sounds a bit like a cover for government surveillance!). Can you tell us a bit about that project? LC: Ha ha – so it does! It’s actually the center for sociological research and their work is really interesting. 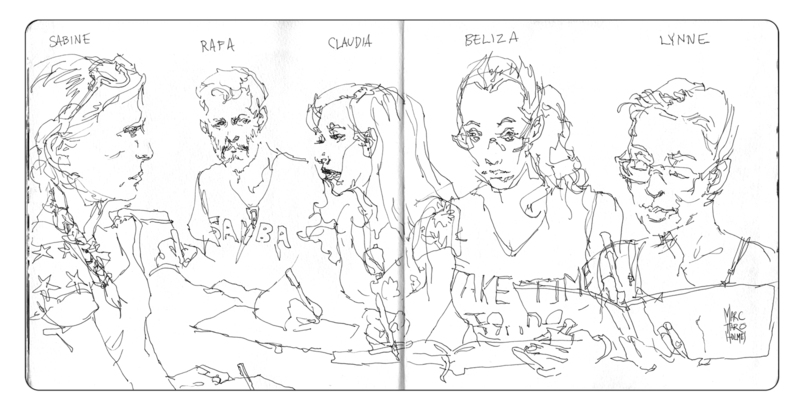 As artist-in-residence, I am sketching a portrait of a-year-in-the-life of the department. I have been sitting among students on the grass or in the refectory, sketching them and their conversations; I’ve been a fly-on-the-wall in corridors and at meetings; I have sat in on lectures and PHD tutorials; I even created a portrait of the centre’s director, as seen through the contents of her desk drawer! Probably the best bit is that I am shadowing various researchers. I have been sketching a project about how we interface with the weather (very pertinent with all the floods we’ve been having) and am just getting started on another one called Dormant Things – all about the objects we all no longer need, but can’t quite bring ourselves to throw away. One afternoon we went into a woman’s house and I drew the hoarded contents of her hall cupboard! I’m using concertina-format sketchbooks, (ed note: we say accordion books over here) so I get a sense of a continuous narrative, an ongoing journey. I’ve filled loads already. MTH: Following up with that – when you go into the world to do an extended sketching project – how does your background in writing books and storytelling with characters come into play? LC: It’s interesting that, though the two kinds of work look very different, there is this strong link, through my interest in storytelling. I didn’t realize that myself until quite recently. This sketching project is perfect for me as I am far more interested in capturing the flavor of what is happening throughout an entire day than creating drawings which are unrelated snapshots. I love how the concertina book allows images to flow into one another and how the linear format adds a sense of time moving through the work. 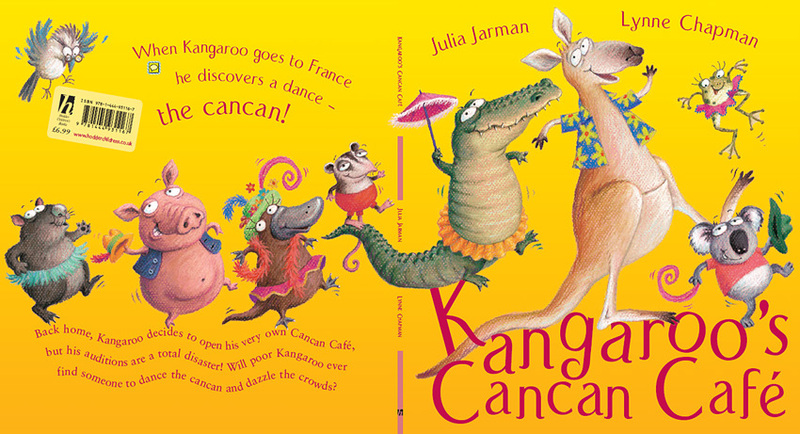 The other interesting link between my children’s book work and my reportage is humor. The ideas and images I pull from my imagination, when I am telling stories for children, are almost always founded in some kind of humor. Now, I am noticing that, when I am recording what is happening in the Morgan Center, I tend to see the funny side, which means I project some of myself back into the images, both through what I pick up on to draw and by the comments I often flow around the image. MTH: Now you’re bringing your picture book experience to Craftsy fans – what was your primary “teaching goal” for this new class? – what do you want people to take away? LC: I chose to help people with characterization, because it is the most important aspect of telling a children’s story, or any story for that matter. Your reader must totally believe in your characters, in order to be drawn into the dramatic tension: you need to make them care. People so often struggle with this and yet a few simple pointers can make a massive difference. I have been sharing tips in schools for years, helping kids (and teachers) to create their own characters, and I’ve seen people’s delight at what they can do with a bit of guidance. So, I crammed everything together into these 7 lessons: all my hot tips and everything I know about drawing personality, conveying emotions, communicating movement and vitality… it was quite a squeeze I can tell you! But, by the time you have worked through the class, you should be able to draw any character you like: any animal or person; and make them funny, cute or mean, old or young. Most importantly, through facial expressions and simple body-language, you will know how to convey what is going on inside their head. Best of all, it’ll be fun! MTH: You can find our more about Lynne Chapman and all her various projects on her blog and her website. Or pick up her book on Urban Sketching from all the usual bookshops.